The 11th annual Winter Storm will be January 15-24, 2019! Winter Storm, one of the signature activities of Maryland's language science community, is an intensive workshop that meets for 2 weeks in late January, immediately preceding the Spring semester. Winter Storm is free to all students and faculty interested in the study of language and it brings together researchers from many different areas of language science for training, collaboration, and interdisciplinary innovation. We regularly welcome visitors from other universities both in the local area and abroad. 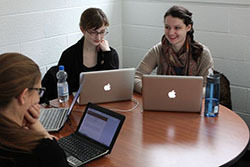 A multi-department team of students designs the activities and schedule for Winter Storm. While the components of Winter Storm vary from year to year, the workshop commonly includes the following categories of events. Research Methods Workshops: In recent years, these workshops have included training in experimental design and in field methods as well as a range of experimental techniques and software. Faculty Lunch Talks: Language Science faculty from various departments speak about their research. Free lunch is provided. Special Interest Groups: In-depth reading and discussion groups, which often spark interdisciplinary research collaborations. Students and faculty are welcome to propose themes and lead SIGs. Toolbox Series: hands-on training in the use of software and tools such as R, LaTex, stimulus presentation software. Presentation Day (final day of the workshop): Participants give summary presentations on the outcomes from the Special Interest Groups and the Research Methods Workshop. Winter Storm is sponsored by the Language Science Center and the NRT Program.